Similar to strawberries or asparagus, rhubarb has always been a common spring staple for me. Growing up, we had a rhubarb plant amongst a strip of overgrown bright orange flowers (daylilies?) along our driveway. Though its size changed over the years, it never failed to produce. I remember checking the stalks to see if they were long or thick enough to use, and at least once or twice a year my mother would make strawberry rhubarb cobbler, or sort of a cross between a cobbler and a pie because she couldn’t be bothered with pie dough. This combination has since been a nostalgic favorite of mine and I’m a big fan of this tart fruity celery-like vegetable. You definitely can’t sit around munching on it but I always felt it was an underused fruit on the east coast. 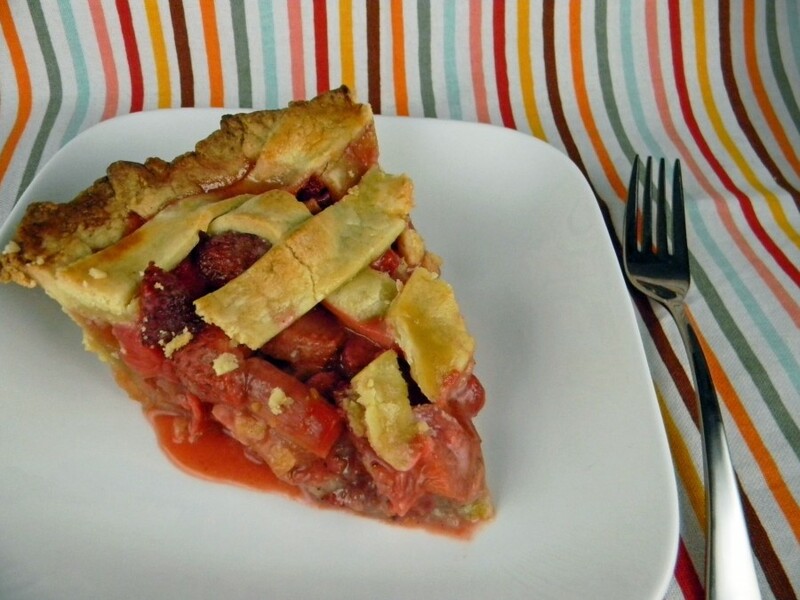 This pie was actually adapted from the rhubarb tart recipe in “The Art of Fine Baking.” By changing from a flan mold to a pie plate and the addition of strawberries, it morphed into a whole new dessert that’s fairly different from its original precise tart parent. Rhubarb and strawberries are just too good to separate. 1. A layer of ground nuts is spread across the bottom of the pie crust before the filling is added. The nuts are a great idea from the original recipe. Not only does it add a toasted nutty flavor but it helps soak up some of the juice from the strawberries and rhubarb without making it soggy. The Lemon zest brightens the taste of the crust and compliments the freshness of the fruit. It’s pleasantly surprising what a difference these small additions make. Grease a 9 inch pie plate and preheat oven to 350 degrees. Roll out pastry on a floured surface until 1/8 of an inch thick. Line pie plate with pastry. Save trimmings for top of pie. Chill. Press ground nuts into the bottom of pie shell. Mix together, rhubarb, strawberries, sugar, cinnamon sugar, zest, flour, cornstarch. Fill pie shell. Roll out remaining pastry dough. Brush with egg milk mixture and cut into strips the length of the top of the pie. 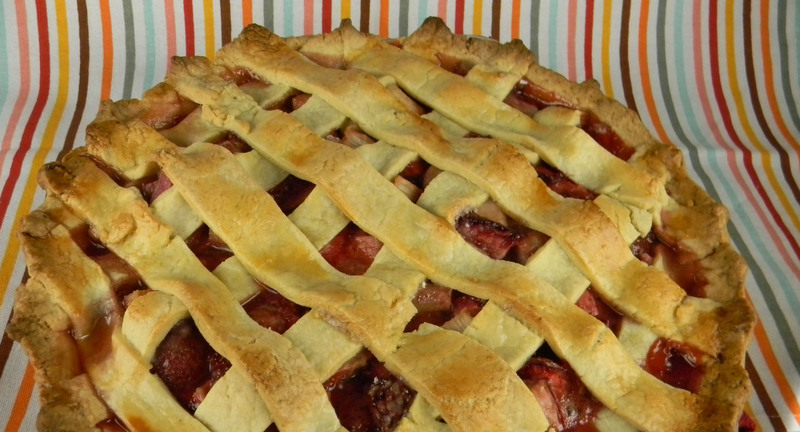 Layer lattice pastry strips on pie. Bake 45 minutes to 1 hour or until juices are bubbling and the top is lightly browned. I love the idea of pressing ground nuts into the tart base. Orange zest would probably work well in the pie dough too instead of the lemon zest, don’t you think? Yum – I’m craving pie now!